What do you do when you find out one of your teenage boys could not find his dirt biking gloves and used your [expensive] gloves to bike in the mud? After wasting time chastising him, you run to your quilt room and pull out the fleece! 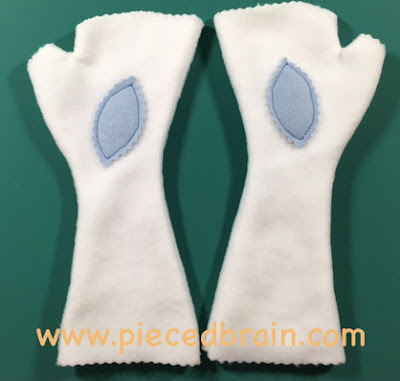 I made these hand warmers in less than one hour and will buy more fleece when I go out today so I can make a few more pairs of different colors. The leaves were cut out of felt and stitched with Aurifil thread. Speedy results! As the pattern suggested I appliqued only one leaf on the palm of the warmers as that side is not so visible. 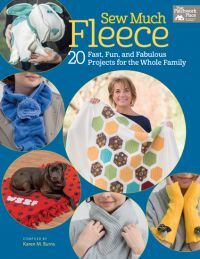 I found the pattern in the book "Sew Much Fleece - 20 Fast, Fun, and Fabulous Projects for the Whole Family" compiled by Karen M. Burns for That Patchwork Place. (All photographs from "Sew Much Fleece- 20 Fast, Fun, and Fabulous Projects for the Whole Family, compiled by Karen M. Burns, Martingale, 2015; used by permission. Photography by Brent Kane. All rights reserved." 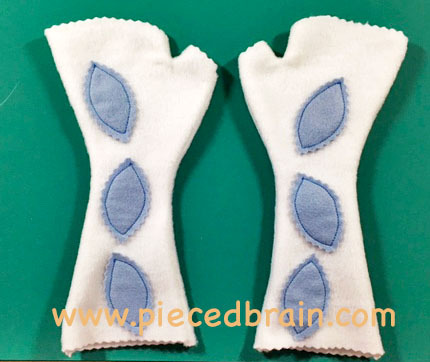 Above right is the photo of the hand warmers in the book - cute, huh? I love the decorative flowers! Using the wavy rotary cutter blade adds flair to the edges, too. They come together quickly making this an awesome 'assembly line' sort of project: I am thinking I can make a couple of pairs for each of my nieces. What a great variation from the simple blankets I am used to whipping up! The instructions for all the patterns are easy with lots of diagrams and tips, exactly what I like about Martingale's books because I NEVER have to go "Huh? What do they mean?". ... and this Pillow Lounger - my grandson Nicholas will love both of them! All are really fast and soft, fun to customize for the recipient as you just need to pick the right print. Karen was inspired as she was choosing the projects for the book. Lovely addition to my library... and some inspiration for you, too. Before you go, don't forget to check out the Tutorial for a cool block and fabric giveaway, which will end this Wednesday, March 9.